Thoughts From My Brain: Dinner. Per Amber's SMS request. Are you planning a trip somewhere? Running off to mexico... I see the passport and checkbook out... did you do something bad?!?! 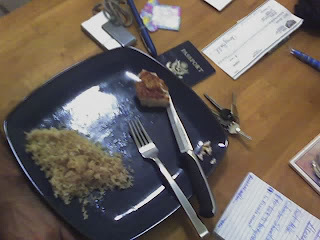 Chicken breast and rice almost gone. Running off? No, nothing quite so exciting. Passport is for getting a Port Everglades ID. Too bad it's nothing that exciting, I am living vicariously through your life. Ahhhh well, you've let me down brother!